Actually, HARVEST MOON (1992) was released almost 14 years ago. However, at the time of its release, it had been 20 years since HARVEST (1972). One might call this a long-awaited sequel. Actually, HARVEST MOON is a much more consistent album. 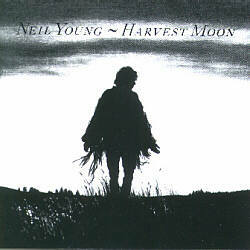 While HARVEST is certainly a collection of good and great songs, it's also all over the map stylistically. HARVEST MOON is country-influenced Neil, start to finish. This is music you could put on for almost any audience. It's just a cool, mellow album. "Old King" is so country, it's actually about Neil's dead dog! The lyrics of this song tend towards the maudlin side, but the uptempo music helps to offset, and even out the mood. "Unknown Legend", "From Hank to Hendrix", and the title track are all latter day Neil classics. "You and Me" is a beautiful tune, with Neil on acoustic guitar and vocals, and Nicolette Larson on backing vocals. Absolute mellow perfection, it even gives a nod to HARVEST's "Old Man" ("Old man sittin' there/Touch of Grey, but he don't care/When he hears his children call"). Neil lodges a mild, anti-war protest with "War of Man" ("No one wins/It's a war of man"). Neil looks back in "One of These Days" ("I never tried/To burn any bridges/Though I know I let some/Good things go"), which he wrote back in 1987. Jack Nitzsche brings in the orchestra for "Such a Woman". I could do without the strings, frankly. I think Nitzsche's arrangement pushes this one to the brink of elevator-musicdom. Luckily, Neil's harmonica break in the middle helps the song snap back to reality. "Dreamin' Man" and "Natural Beauty" were both written in 1989, with the latter being a live recording from Portland, Oregon in 1990. Neil saved them for just the right time, as they fit the mood and tone of HARVEST MOON perfectly. In fact, they help the album to finish just as strongly as it began. Bottom line: Very good album. Some say it's "great", and it might be. If not, it's definitely knocking on the door of greatness. This album sounds like something I'd want to check out. One question: What makes it a sequel to Harvest? It's more consistent stylistically, but does it have other stuff in common with the earlier record? Yeah, sorry, I probably should've explained that better in the original post. It came out on the 20th anniversary of HARVEST. Also, it was recorded with the "Stray Gators" line-up, and had many of the same guests on backing vocals (including Linda Ronstadt and James Taylor). It also has a song ("Such a Woman") that has the big orchestra arrangement by Jack Nitzsche, similar to "A Man Needs a Maid" from HARVEST. And, of course, there's the similarity in titles, HARVEST and HARVEST MOON. I've seen and heard it referred to as a "sequel". I guess I understand the notion (points mentioned above). However, I think there are at least as many differences as there are similarities. HARVEST MOON certainly stands on its own. So, if it's a sequel, I guess that makes it a good one! With your recent interest in country music, I would HIGHLY recommend HARVEST MOON and probably AMERICAN STARS 'N BARS as well.